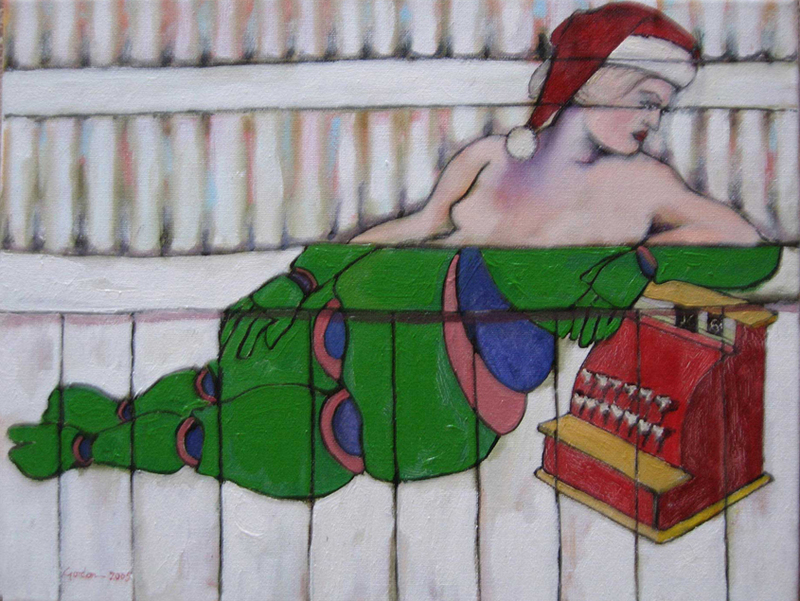 Books have featured strongly in my artistic iconography. My reverence for the (potential) knowledge contained in books is a legacy from my father. 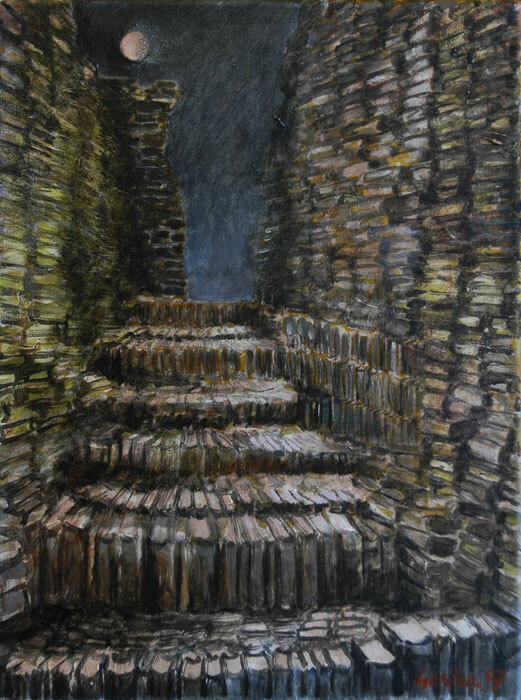 In this painting I have referenced the architecture of the great Zimbabwe ruins. These ruins, situated at Masvingo in Zimbabwe, constitute the most significant archaeological site of pre-colonial times south of the Sahara in Africa and are considered to be a remote outpost of the powerful kingdom of the Monomatopas. 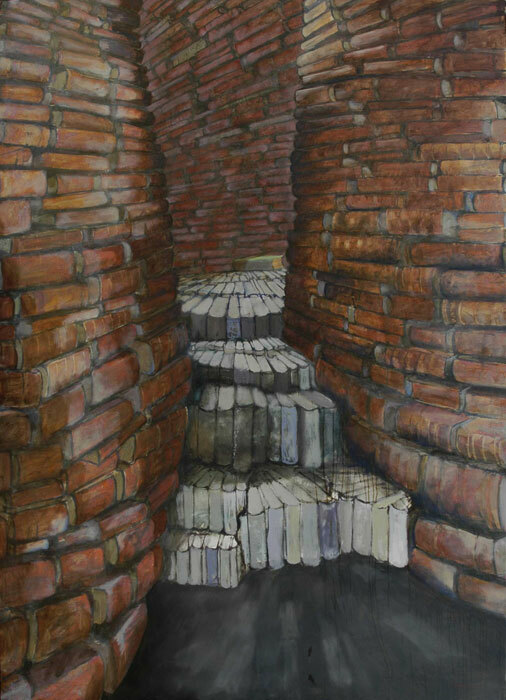 In reconstituting them as architectural structures made entirely from books I am associating and locating the collective wisdom of the ages contained in them; in the very fabric of the ruins. The books and their contents now part of the ruins are a lament on what I perceive as the rapid loss of interest in knowledge. The general and ready availability of knowledge through the internet has resulted in a distinct loss of appetite for its acquisition. Information does not equal knowledge. I genuinely fear we are entering a new dark age. This painting, one of three, is also a comment on the sad demise of the book in its traditional form being superseded by virtual books in the digital age. In these images I am combining my respect for the heritage of both Europe and Africa. 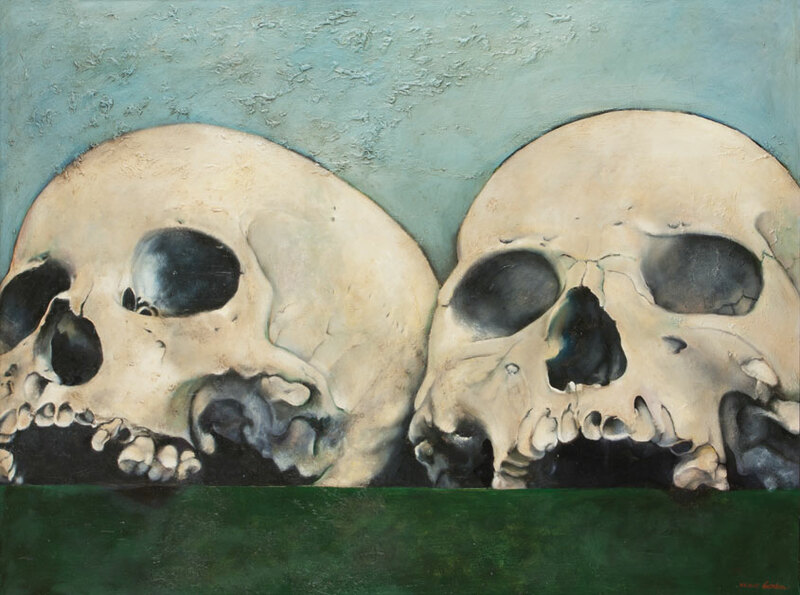 Concerns with classical iconography have strongly influenced many of my works. I had related strongly to classical Greek, Roman and Renaissance imaging of the human form during my undergraduate studies. This was further fuelled by an extraordinary privilege of having access to a period painting. In the late seventies and for a period of about five years, I became the custodian of what was believed to be one of the existing (multiple inferior) versions of a Venus painting, emanating from Titian’s studio C1545. The other, in the Uffizzi in Florence is also considered to be an inferior one, while the finished presented piece has disappeared. Researching and attempting to establish a provenance for this work introduced me to the workings of one of the greatest Renaissance artist’s. The respect I developed for Titian’s art became a lifelong passion. In wishing to ‘reclaim’ my Titian of fond memory, I devised a contemporary version which became part of my Mythologies exhibition of 1996. 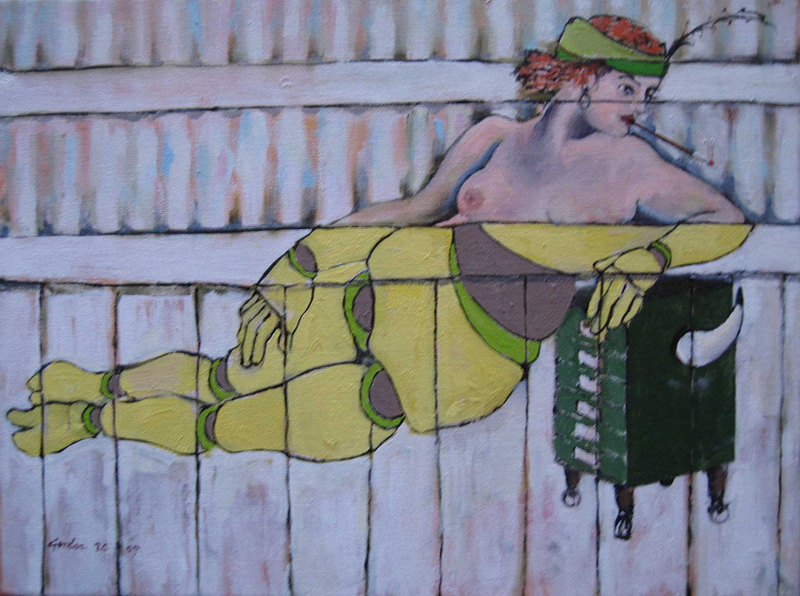 I positioned the Venus on a Trompe L’ Oeil fence as painted graffiti. Here my idea was to re-contextualize graffiti or street art, and position it firmly in the studio or gallery context. The Venus figure is derived from an artist’s manikin as model, now reconstituted in an art historical reference. The manikin becomes part of the fence as graffiti but the face and upper torso are illusionistically painted to look real. The source of the fence was the wall in my stable/ studio/residence, just off Alice road in Newtown (Sydney) and the props under the Aphrodite’s arm are various items that relate to me. This latter element has personal resonance and consolidates my reclaiming the Venus. I have subsequently in 2005 made a small series of six permutations of this same composition of which this is one.